“TributeArt Live!” creates an interactive blend of music, canvas and paint while celebrating the greatest bands and musical artists known today. “TributeArt Live!” engages the audience in a creative journey, stimulating their senses and captivating their interests as the original artwork featuring the iconic band or musician comes to life on canvas accompanied by their own music with each painting taking 10-15 minutes to create! 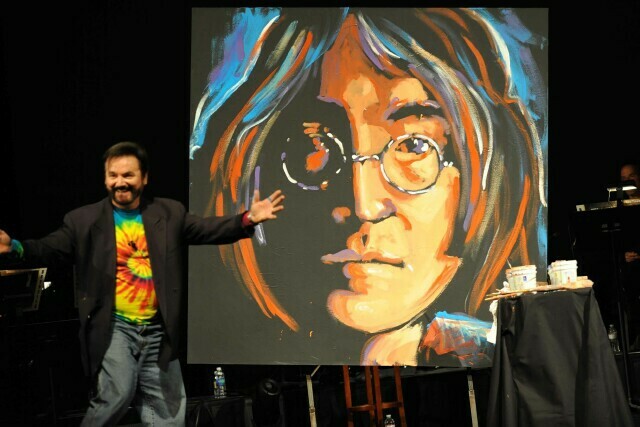 The show is performed using 1-4 musical artists, sports figures and other celebrities which can include “The Beatles, John Lennon, Jimi Hendrix, Carlos Santana, Bono, Jim Morrison, and many more. Clients are welcome to keep the valuable artwork.
. “TributeArt Live!” can be customized to brand an event in several ways, using the event’s theme, logo, product recognition, Company’s CEO or company VIP’s.